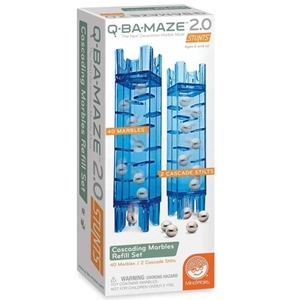 Add height and marble madness to your Q-BA-MAZE builds with two Cascade Stilts and 40 steel marbles that clatter, teeter, bounce and leap through your marble run. For use with Q-BA-MAZE 2.0 cubes (sold seperately). Recommended for ages 6 and up. Warning: Choking Hazard. Toy contains marbles. Not for children under 3 years.